Four new polls have come in since Friday, lifting President Bush's approval trend estimate to 34.7%, from last week's 33.4%. The new polls are AP/Ipsos (3/5-7/07, 35% Approve/65% Disapprove), CBS/New York Times (3/7-11/07, 34%/58%), CNN/ORC (3/9-11/07, 37%/57%) and LATimes/Bloomberg (3/3-11/07, 38% Approval, the disapprove rate has not yet been released.) With four polls all coming in above the previous trend estimate, the evidence favors an increased approval rate over last week. However, there remains quite a bit of noise in the estimates. The new CBS polls shows approval of President Bush from Republicans rising substantially since January, when it was 63% to 65% in February and 75% in the latest poll. One advantage of a Democratic Congress for the President is it gives his partisans an opponent to blame, and may as a result help improve the President's support among Republicans. We'll have to look into this a bit more systematically. For a full description of these graphs, please see this earlier post. The last six polls appear below. With the new estimate of approval, all four new polls (and indeed, all of the last six) are pretty close to the estimated trend. This at least means that no single outlier is unduly influencing the current estimate. 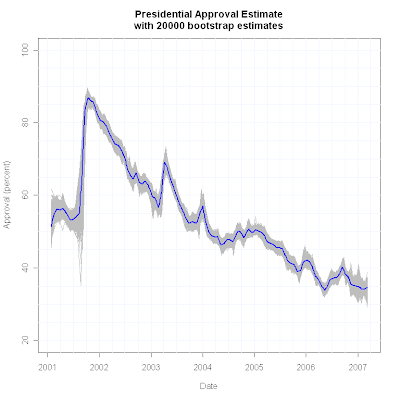 To assess the variability of the trend estimator, I run 20,000 bootstrap samples of the approval series, and estimate the trend 20,000 times. 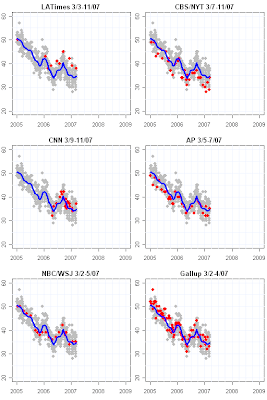 The gray region below shows all these samples, while the blue line is the current estimate. It is worth noticing that the spread of estimates over the past two or three months has been a bit wider than earlier parts of the series. In part this reflects an intrinsically greater uncertainty of the estimate at the end of the series. 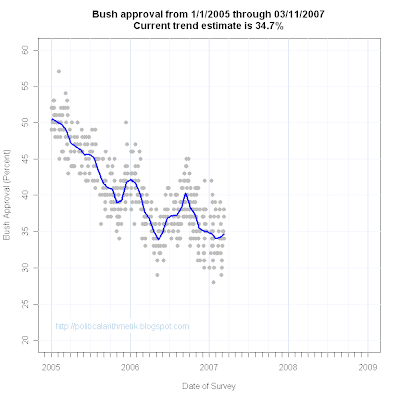 However, it also seems that the approval polling since the November election has also been a bit more variable than in most of 2005-06. 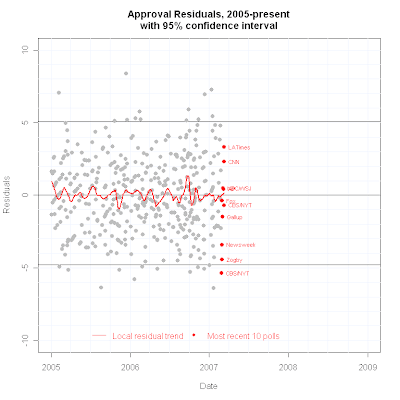 Whether this reflects a plateau in approval with more randomness around a roughly stable mean, or if the shift to a Democratic congress has allowed for more variability is an interesting question. 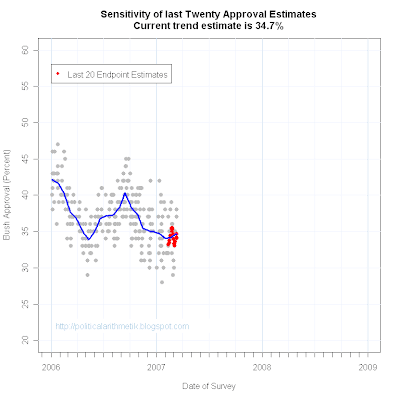 Finally, we can take out each of the last 20 estimates and see how sensitive the trend has been to these polls. There has been quite a bit of variability, foretold by the bootstrap results, over a range of about 5 points for the trend estimator. That's a lot less than the range of polls, as you can see dramatically in the figure but still shows that the trend estimate is itself subject to uncertainty.